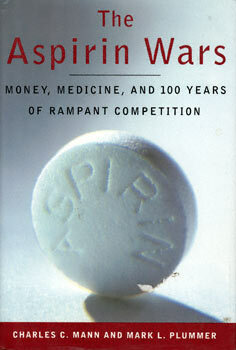 Aspirin makes have a remarkable, perhaps unique, history of competition; they have been slugging it out over exactly the same ground since the end of the First World War. Some aspirin brands (such as Bayer) are pure acetylsalicylic acid (ASA), the scientific name for the chemical known as aspirin; others (such as Anacin and Bufferin) add ingredients like caffeine and antacids; still others (such as Ecotrin) wrap the ASA in a special coating. Because ASA has remained unchanged since its invention in 1897, however, all aspirin brands, no matter how new and improved, have the identical active ingredient, and medical science has yet to show that any of these fancy versions are better than aspirin alone for headaches, fever, and inflammation. In capitalist societies, such a situation--companies selling equally effective products with big potential profits--virtually guarantees furious competition. And, indeed, the aspirin makers have a record of industrial warfare that provides a vest-pocket history of the mixture of marketing, litigation, technology, and competition that characterizes so much of business in this century. Another way to put it is that the annals of aspirin give a glimpse of the incredible lengths to which people will go wo put something in a box and sell it.